This year Mom gave me the assignment to bring cranberries to Thanksgiving dinner. Being me I had to find some interesting recipes to use. I solicited my Facebook friends for their favorites. I should have know that my gourmet cook and friend, Lisa, would have lots of ideas. While this is not one that she had actually made before she and I thought it sounded very interesting. I haven't sampled it too much yet. It in the fridge cooling a bit. The verdict will be in tomorrow as to how tasty it is or not. But in case it is tasty, here is the recipe. The cooking time in this recipe is intended for fresh berries. 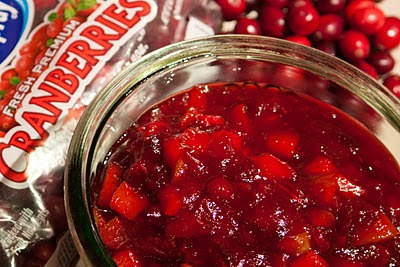 If you've got frozen cranberries, do not defrost them before use; just pick through them and add about 2 minutes to the simmering time.